Yikes! I am behind on lots of pictures. I still haven't shared these photos from my brother Jason's house. There was one room in this house that was a little bit tricky to figure out exactly how to make it function. He wanted to have a space for a really simple, basic home office (the main Dear Lillie office is separate) and although it didn't need to function as a true guest room it did need to have a mattress in here for guests (mainly me - haha!) He also didn't want to spend very much so we tried to be keep it simple and just kind of clean it up and make it seem a little more put together. The first thing we did was remove the saloon doors (much to the girls' dismay) and the shelves. Once that was done we started painting. This was the neopolitan room because the walls were pink, white and tan. It looked just like a scoop of neopolitan ice cream. 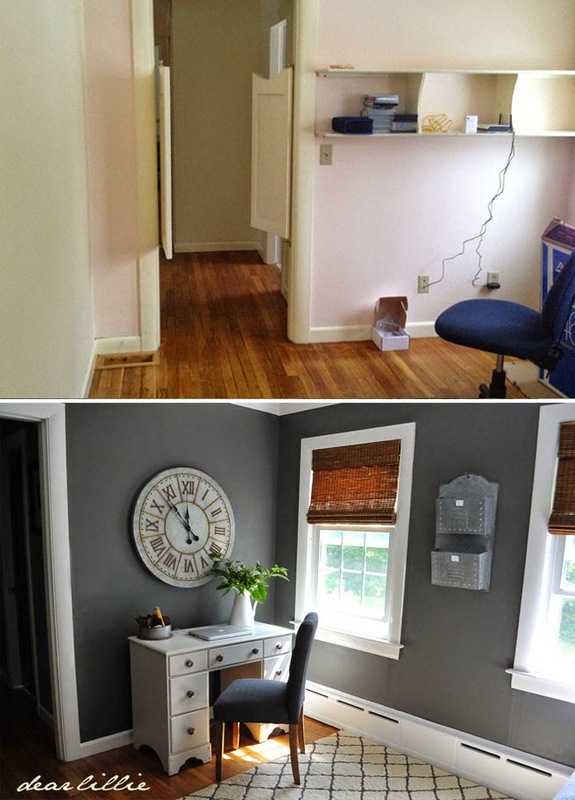 We painted the trim and doors with the same paint we had on hand from the rest of the house. 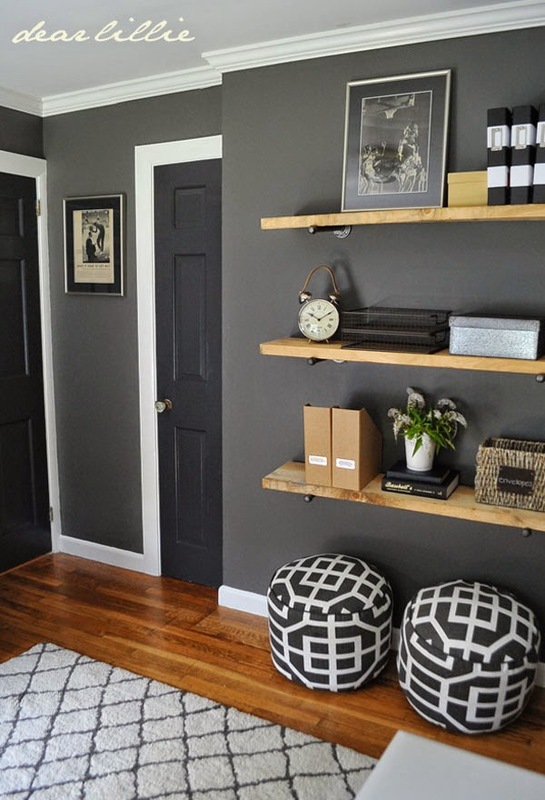 Then we used Kendall Charcoal for the walls. 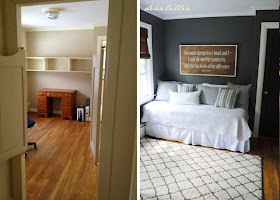 We painted our master bedroom in our townhouse that color almost 6 years ago and it's still one of my favorite colors. 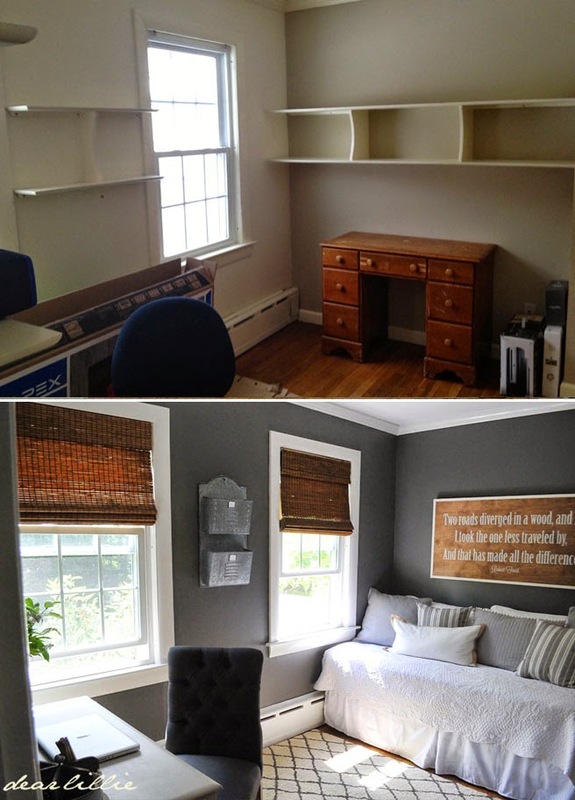 We found some inexpensive roman shades at Home Depot for the windows and painted his childhood desk (I'd still like to change out the knobs but have yet to convince him that's a necessary expense). My mom got a new rug for her guest room (I can't wait to photograph it next time I am up there. I didn't have time to during my last trip but it is beautiful!) and so we borrowed this one from her. We were hoping it would be perfect, but I'm not sure it looks or works quite like I thought it would so I am not sure we are going to keep it in here or not. 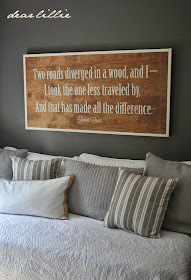 And then we made this sign for above the bed with one of my favorite Robert Frost quotes and made the shelves. And then pretty much just used some accessories we already had and purchased a few to fill in some of the empty spaces and that was about it! 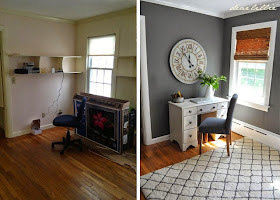 It was a relatively quick and inexpensive makeover which was nice! This is fantastic! 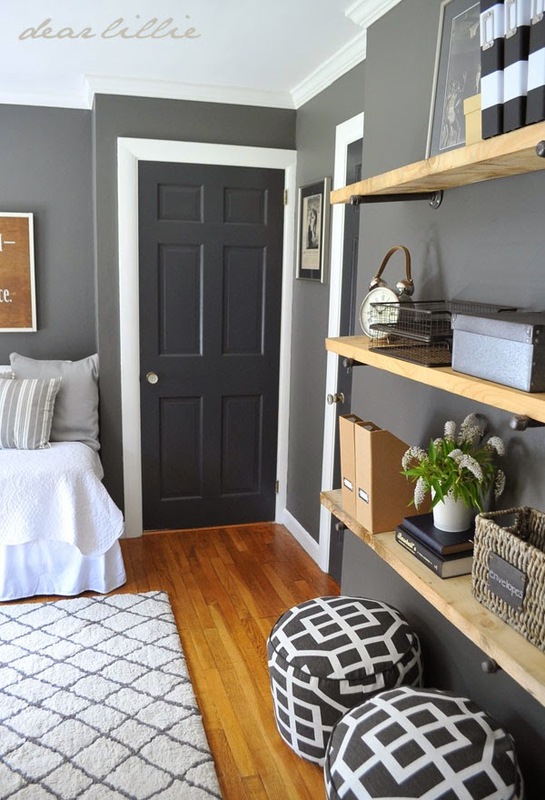 We have an itty bitty room we want as a guest room and an office and this is a super idea! 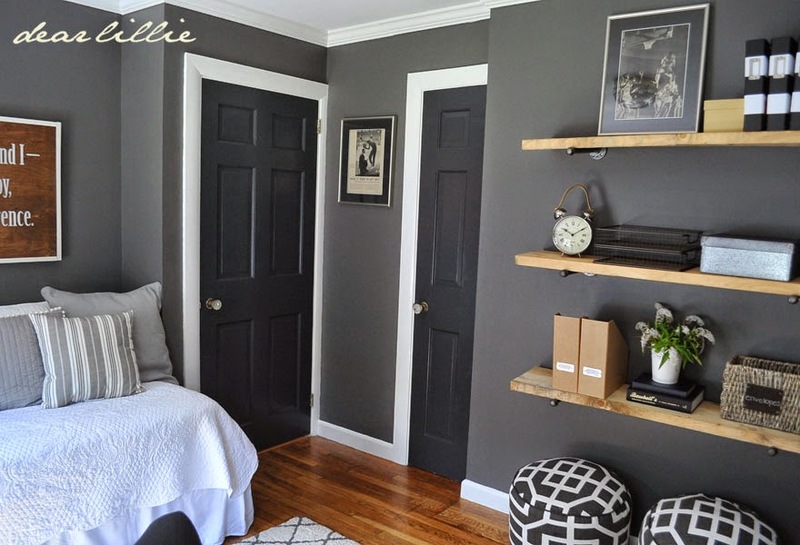 Love the open shelving and the bed! Personally, I love the rug in there! 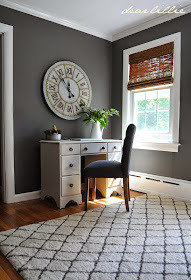 Thank you, thank you for this wonderful inspiration for an office/guest room! You have THE BEST ideas and I love that you always include a source list. I can't tell you how many times I refer to your blog for sources, inspiration and color combinations, as well as your fabulous art. Looks awesome, bet he loves it now! Hi! We used Wrought Iron by Benjamin Moore. waterborne/oil called Advance or oil? Thank you! We used Aura in Semi Gloss and have been very happy with it. We ended up going with the Advance for our cabinets, as it has a slightly harder finish (it requires note coats though). Thanks, Tamara! 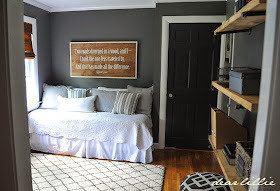 We used the color Wrought Iron by Benjamin Moore. I love the changes, especially the rich gray color. Beautiful room! I like the rug. It looks soft and cozy and brings some warmth to the room. Goog Lord, what a difference! I love that Kendall Gray color too. It just feels clean, and it's relaxing. Plus so pretty with the whites and browns. I love the color specially. So peaceful. Nice. Hi, Tiffany! We go with eggshell finish for walls. Where did you find the 2 ottomans? Hi, Tona! The two poofs below the shelves are from Target. Hi Jennifer, did you paint the doors also and witch color is it? I like them but im not sure is it black or dark grey? Hi! 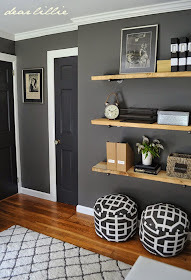 We painted them Mopboard Black by Benjamin Moore. What was the stain color you put on the shelves? Hi there! 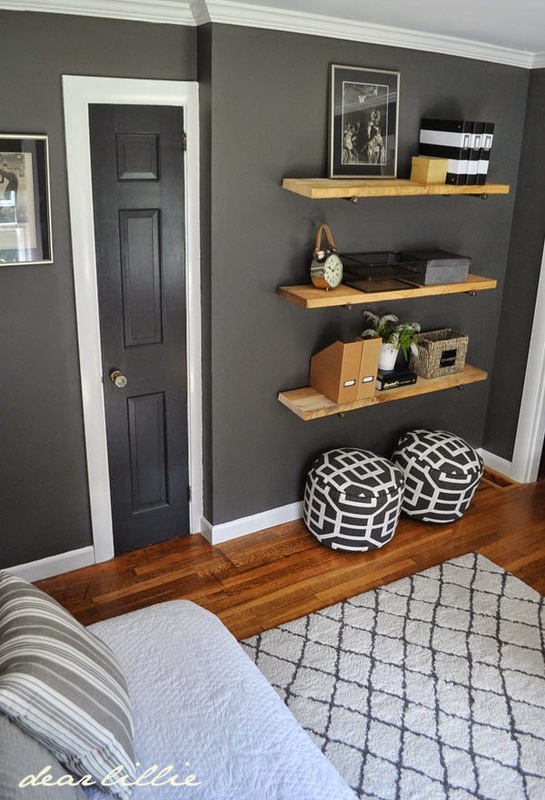 We didn't stain these shelves. Oh! Ok!! So all natur-allll! The doors in Jason's house are Wrought Iron. Do you have any specific details about the shade color? And brand? Thanks! Hi! They were from Home Depot, but neither of us could remember the brand or color--sorry! Just stumbled upon your blog and really loving your style. Wondering where you purchased the day bed? And does it have a trundle? Thanks, Lindsey! I can't remember where we purchased it, but it is just a metal frame underneath that we have had forever! Thanks! The rug is from Target. I love the room, my son wants his room to be gray with black accents. I'm going to show him this room. thanks for giving us the names of the colors. I am working on my kitchen and it has metal cabinets and I want to paint them do you have a suggestion on what would be the best paint to use? Thanks, Shauna! Unfortunately we have never painted on metal before, so we don't know what would be best, but I'm guessing you would need some sort of special primer. O wow, perfect colour scheme, I love it so much, ive been looking for ages now for the perfect colours to make my office thats so perfect, one question what colour is the roof? Thanks, Gerald! The ceiling was that color when I moved it, so we have no idea what the color was--sorry! What type of finish do you use for the doors? Hi! We used Wrought Iron in a semi-gloss finish.